Local Dallas businessman Roland Parrish pictured with recipients of the $10,000 scholarships awarded to the top three Dallas ISD participants. 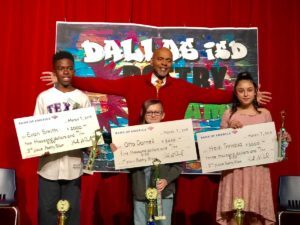 The inaugural Dallas ISD poetry slam was nothing short of a memorable night at the Edison Learning Center as infectious energy filled the auditorium with excited students, proud parents and supportive peers. Participating students competed for $10,000 in scholarship awards through a generous donation from business entrepreneur Roland Parrish. His charitable contribution provides a stepping stone for kids to receive opportunities in higher education. More than 100 fifth graders from 60 schools exhibited impeccable talent and literary creativity under the theme, “Me, My Community, My Future,” which challenged students to write and perform poetry related to their communities, using the power of voice and dramatic gestures to bring their words to life. Ultimately, three winners used this platform to showcase their communal visions and empowering messages with outstanding slam performances. This competition was a collaborative effort of the Dallas ISD Reading Language Arts Department and the Racial Equity Office, which partnered with Flocabulary, to give students an opportunity to express themselves through the power of poetry.